After arriving in Stockholm, clearing customs and taking the long walk through baggage claim, I headed to the ARN Express. 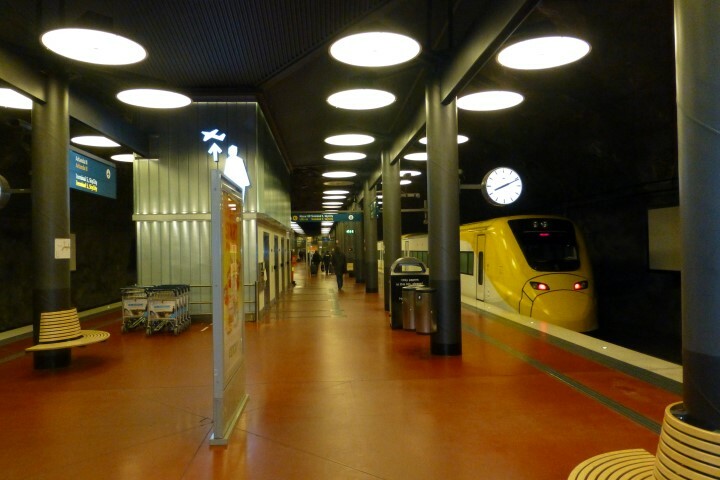 This express train connects the international airport to the central station in downtown Stockholm. I love quick City/Airport connections – it’s almost critical when doing weekend trips like this. I’ve can’t tell you how much I love the Heathrow Express or the Shanghai Maglev. I decided to purchase my ARN Express Tickets online before departure. It’s great because you don’t need a paper ticket and you don’t even need to print a receipt (although I did, just in case the system didn’t work right). All you need to do is have with you the credit card which you purchased your tickets (online). As the ticket checker comes through you just hand them the card you used and you are good to go. As I entered the station, I saw the train just pulling out. Luckily, the train was running every 8-10 minutes that time of day. I sat down and waited. Several people came running down the stairs and were visibly agitated that the train wasn’t there waiting for them. The train pulled in and we all boarded. From the time the train entered the station until we were en route to the Central Station was less than 5 minutes. The seats were comfortable if not a bit tight. At least on my trips the train was a near ghost town. There was plenty of room to sit and to store your luggage near your seat. Once aboard, it took less than 20 minutes to make it to the Central Station. The ticket checkers came and were very nice – two young women working in tandem, swiping cards and greeting every guest. The train is equipped with WiFi but on both my trips (in and outbound) it didn’t connect quickly not did it stay connected. I think I was able to get a quick social media check and the next thing I knew we were pulling into the Central Station. My two biggest concerns about taking this train into the City: 1) missing the train and having to wait 30-60 minutes for the next one because of maintenance, etc on the tracks; and 2) leaving the Central Station and walking the wrong way to my hotel. I knew my hotel was less than a 10 minute walk from the station, but if I went out the wrong door and started wandering down the street the wrong way, it would extend my transit time. Luckily I did some research before I left and found the proper exit and upon hitting the street, I saw the Sheraton just a couple blocks away. Next time I fly into Stockholm, I wouldn’t think twice about taking the ARN Express — and quite honestly, I didn’t put a whole hell of a lot of thought into the train. It was much cheaper than a taxi, got me where I wanted to go, very quickly and safely. I would also highly recommend this mode of transport for anyone visiting the City. I do wish Chicago had a nice high speed, direct train that would take you from ORD to the Loop. Having a connected Subway is a great benefit, but I think we, as Chicagoans, need to step up our game. How did you transit from ARN to the Central of Stockholm? Do you dig the high speed trains or do you prefer the easy of a taxi after a long flight? What Cities do you think have the best Airport – City Center Transport options? TSA announced earlier today that they will be enhancing security measures at certain airports with direct flights to the United States. As always, the TSA reserves the right to search your person and both your checked luggage and your hand luggage. While they examine your items they may ask you to power up some of your electronic devices and if they do not power up (no charge or a broken device) then they may not be permitted on board the aircraft. Make sure you plan ahead and have your devices juiced up. You’d had to lose your mobile phone, tablet or camera or even be denied boarding because it lacks power. Depending on my destination, I’ll often have a travel phone with me and at the end of my trip, I may not have it charged (no need to keep it charged as I won’t use it once I land back in the US) – I’d be quite frustrated if I lost this unlocked phone because it wouldn’t power on. There is obviously some sort of semi-credible threat that pushed this new security measure into being – let’s hope this is a short term issue and these additional measures do what they are intended to do. You can read the full press release here. Are you altering your international travel plans because of this new advisory?